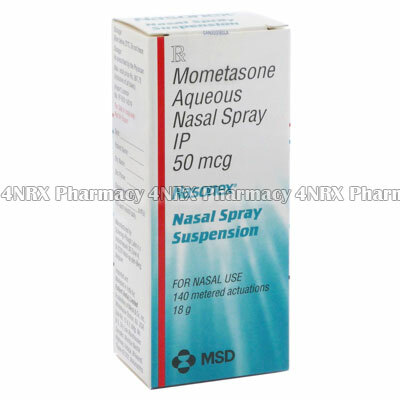 What is Nasonex Nasal Spray (Mometasone Aqueous) used for? Nasonex Nasal Spray (Mometasone Aqueous) is an inhalable medication used to treat patients suffering from seasonal allergies or allergic rhinitis. It contains a corticosteroid that operates by reducing inflammation to prevent irritation, runny nose, and sneezing. This action may also make it useful for treating nasal polyps in patients over the age of eighteen. Your doctor may prescribe the use of this medication for other unlisted purposes, as well. How should I use Nasonex Nasal Spray (Mometasone Aqueous)? Follow your doctor`s instructions and those included with the packaging while using Nasonex Nasal Spray (Mometasone Aqueous) to get the safest and most effective results from treatment. The normal dosage is one spray administered once or twice each day, but your individual directions will depend on your current health, the condition being treated, and the severity of your symptoms. These are administered by gently shaking the bottle to mix its contents, insert the nozzle into your nostril, and inhale while operating the pump to release one spray. You are suggested to alternate nostrils if more than one dose is recommended to avoid irritation. If you have not used the medication for several days it may be necessary to prime the pump by pointing the nozzle away from your face and operating the pump until one spray it dispensed. What are the side effects of Nasonex Nasal Spray (Mometasone Aqueous)? Stop using the medication and contact your doctor as soon as possible if you experience any serious side effects such as difficulty breathing, chronic nosebleeds, fever, flu symptoms, vision problems, or sores in the nose that will not heal. These conditions may require lower doses, reduced frequency of administration, or emergency medical attention in serious cases to prevent further health complications from occurring. Nasonex Nasal Spray (Mometasone Aqueous) should not be used by patients who are pregnant, breastfeeding, under the age of six, allergic to mometasone, or who have had a bad reaction to similar treatments in the past. Also inform your doctor if you have had recent nasal surgery, an infection of the nasal passages, or tuberculosis of the lungs. These conditions may cause unexpected health problems requiring special adjustments to your regimen. Strictly use Nasonex Nasal Spray (Mometasone Aqueous) as prescribed and follow all instructions provided by your doctor. Safe, suitable, and optimum dosage can vary and is dependent on the patient`s health and medical history, as well as the condition you are treating. Nasonex Nasal Spray (Mometasone Aqueous) may not be safe or suitable for all patients. Always ensure your doctor is informed if you are pregnant or breastfeeding, using any other type of medication (including non-prescription medicine, vitamins, and supplements), as well as if you have any allergies, other illnesses, or pre-existing medication conditions.